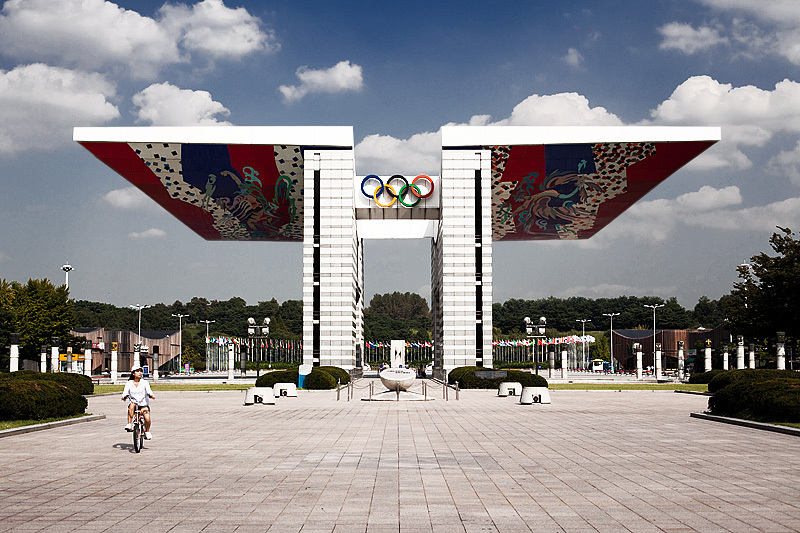 The World Peace Gate built for the 1988 Summer Olympics still stands at Olympic Park in Seoul. A memorial stands in front of the World Peace Gate. Note the small spherical nob in the foreground. Unintentional but you can see my tiny reflection. Note, also, the camera and arm's shadow in the lower left. I'm doing a bit of a one-handed jobber because I didn't want to include any more shadow than necessary, particularly the silhouette from my bulbous melon. 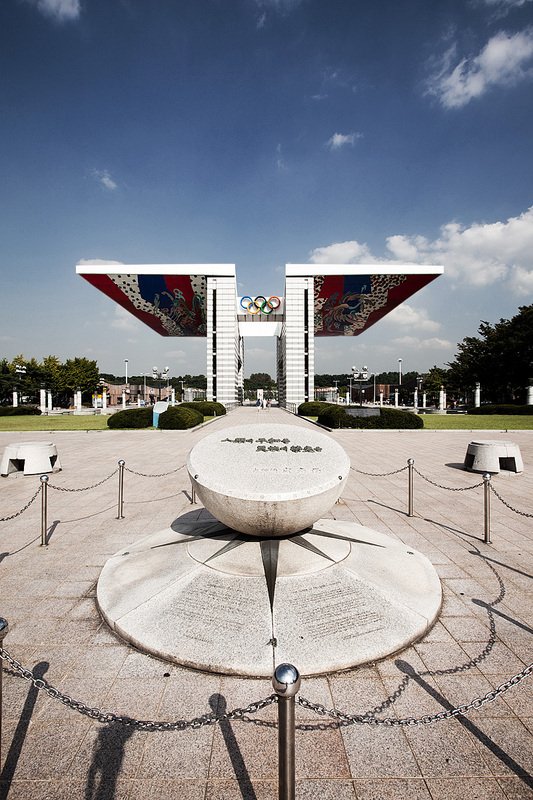 With wing's spread out, the World Peace Gate looks ready to take flight much like South Korea in 1988. 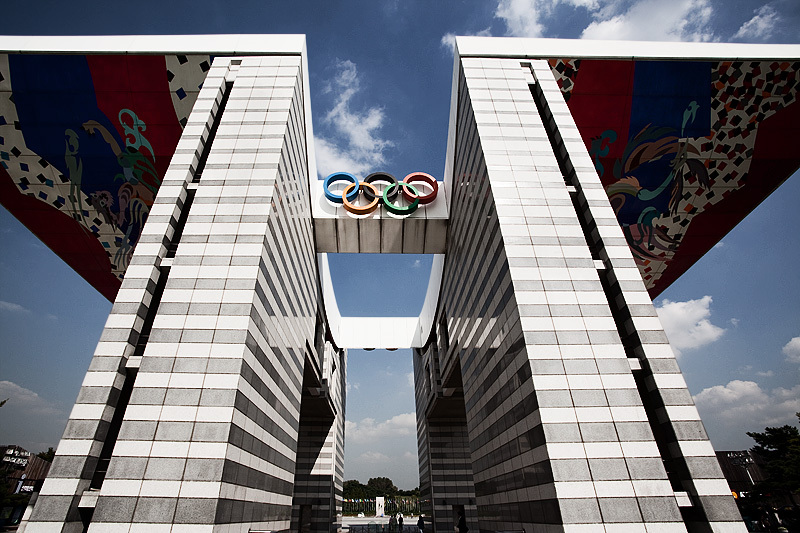 It's widely recognized that S. Korea emerged as a world economic power around the time of the 1988 Seoul Summer Olympics. A country the size of the US state of Illinois captured the 11th spot on the list of world GDP. A visit to Korea and you see the work ethic that made that achievement possible. I just wish they'd take a break and enjoy their accomplishments for a minute instead of rushing through a scripted life of non-stop studying and work. Just don't go as far as dumping a well-paid dot-com job for a life of roach infested hotels traveling in developing world countries, uh hmm.